Enjoy the bright lights of Sin City in Vegas Diamonds, a 3 reel, 5 payline fruit machine from ELK Studios. It comes with multiplier wilds that can boost payouts by up to 5x as well as respins and a Wheel of Fortune-style bonus that awards cash prizes and free spins. Play on all devices from between 20p and £100 per spin. There’s a suitably glitzy feel to the design in Vegas Diamonds. The Las Vegas skyline forms the backdrop to the reels. There you’ll find cherries, lemons, melons and single, double and treble bars. Land 3 matching symbols on a payline to create a winner. The top payer is the Vegas Diamonds symbol which pays 30 times your stake for a 3 in a row combo. Land 3 Vegas Diamonds anywhere on the reels and they’ll nudge so they fill the middle row. Perfect Match Respin feature - land the same stack of symbols on reels 1 and 2 they will lock in place and reel 3 will respin 3 times to give you a shot at landing a monster combination. If you see 3 Vegas Diamonds on the reels, the Vegas Diamonds Nudge feature comes into play where they nudge in place to appear across the middle reel. The game is all about the Vegas Diamonds Fortune Wheel feature which is triggered by landing 3 of the wheel bonus symbols on the same spin. You’ll then be awarded 3 spins of the wheel. These award cash prizes and free spins. There are bronze, silver and gold wheels. If the pointer stops on a Level Up segment, you’ll progress to the next level wheel with increased prizes on offer. If you land on the Free Spins segment, you’ll trigger the Free Spins feature where you’ll receive 5 free spins complete with a 5x multiplier. Any Bonus symbol that lands during the free spins adds an extra spin on the wheel you’re on. Vegas Diamonds is a classic fruity with some extra features added. They combine to good effect and make what could have be a rather dull slot game much more interesting. The really big awards are on offer from the gold bonus wheel – up to 1,000 times your stake. That’s not the easiest to open up. Watch out when you do though. 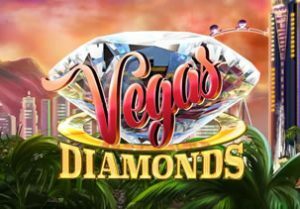 If you enjoy old school fruit machines, then Vegas Diamonds should offer plenty of thrills. If you win on all 3 wheels and do well in the Free Spins feature, you can pocket 2,000 times your stake. I recommend you try other slot games in the trilogy – Route 777 and Ivanhoe.